Cherry Berry : When Can Babies Start Swimming? Babies can SAFELY start swimming by the time they are a half year old (because your baby won't be able to regulate his body temperature until he's around 6 to 12 months old, you need to make sure the water's warm enough for him. ~ babycentre.com) with PROPER supervision. Since baby Gian enjoys bathing in his tub everyday, hubby and I decided to buy him a neck float from Baby Spa at Changi City Point and let him have his first swimming lesson. We made sure that the neck float was safely locked and the water is not too cold before we let him have his first swimming pool experience. Baby Gian is now a certified water lover just like his big sister Kyla! 1) The pool water temperature should be at least 84-86 degrees Fahrenheit. LET YOUR BABY HAVE A FUN AND SAFE SWIMMING LESSON! Cute and adorable, these two words strike in my when I see this blog and little angel, I think parents should care their babies by using good quality baby products. Oh, how time flies! Baby Gian has grown big so fast! Safety first, and this is a perfect buy! What a great, fun picture for the day, Cher! Baby Gian is so adorable and he does seem to be enjoying his new adventure!! Thanks for sharing! very informative post, Che. 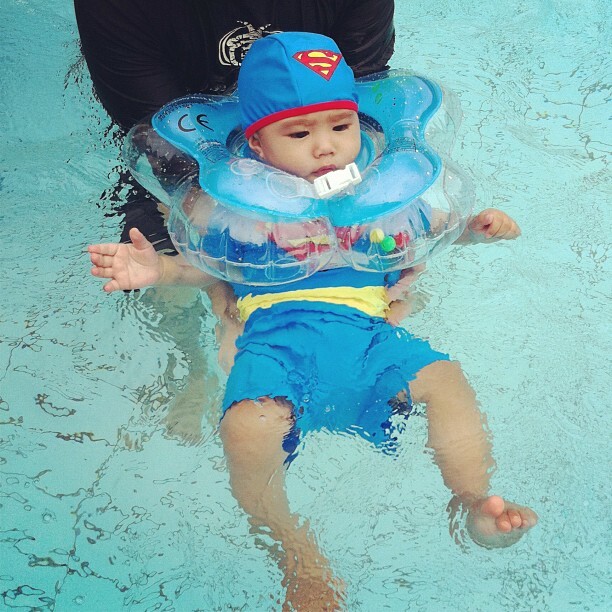 Gian is too cute there, yes, I so agree with you about SAFETY first, and watching baby swim with proper care. oh how adorable is that !!! I watched a show one time teaching babies how to swim and it was fascinating to see babies able to float even without the neck float. They just lay them down on the water slowly and they managed to stay above the water. Amazing, I can't wait to see Gian start swimming !!! In the system of "Baby swimming" in Norway they start at 6-7 weeks old (4kg)! And the water needs to be warm, 33-36Celsius. The safty instruction are importent! Both my children participated and they loved it!